- Provide strength and advanced combat skills. - Cost: Available from the start. - Allow the destruction easier and damaged walls. - Activation: set before the corresponding wall and press the indicated button. - Kill targets quickly in close combat or makes them unable to fight. - Activation: Come near to a destination and press the indicated button. - This upgrade allows the lifting and throwing heavy objects. - You can carry more objects in your inventory . - You can carry even more objects in your inventory . - You can carry even more objects in your inventory. - This augmentation regulates and improve weapons handling . - Allow standard movements and control while aiming. - This ability reduces the movement-induced crosshair delay slightly. - This skill prevents movement-induced crosshair delay to a large extent. 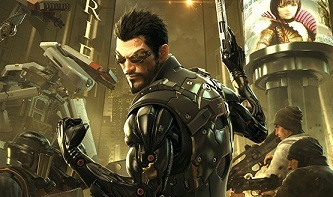 - The cybernetic prosthetic arm granted a rebound damping by default . - Reduce the recoil slightly. - Reduce the recoil considerably. - This skill is the standard charging time your arm prosthesis. - Reduce weapons loading time. - Shorten weapons loading time considerably. - With this augmentation you can fire off a shockwave and thus hurl objects on the ground. - Throws back fire a quick shot off the targets. - Activation: Open the augmentations and has the ability to a Slot (tap for activate) or activated directly. - Stunned shockwave objectives with a concentrated PEPS . - This allows augmentation hacking from a distance. - You can ping and hack AI objects around. - Activation: Places the crosshair over the mark of a hackable device and presses the button indicated. - Cost: This skill is unlocked when you buy remote hacking. - You can temporarily disable remotely robots, guns, and security cameras. - Activation: Place the crosshair over the mark of a hackable device and presses the button indicated. - This augmentation can incapacitate your targets with a noiseless power arc. - This upgrade can focus on a single target. - Cost: If enabled with Tesla. - This upgrade can simultaneously focus on two objectives. - Activation: keep to detecting multiple targets and release fire. - This upgrade can focus on four objectives simultaneously. - Distance, can doubled the Tesla target detect. - With this augmentation you can fire Nano blade as a projectile . - With this upgrade you can fire the Nano blade and thus to nail targets. - Activation: Open the augmentations and has the ability to a Slot (tap for activate) or activate directly. - Cost: If activated with Nano blade. - This skill heated to the Nano blade. It is an explosive variant that explodes into smaller fragments.